Images on this page are copyright © 2003 Duane Gordon/Dollymania and may not be reproduced without prior written consent. 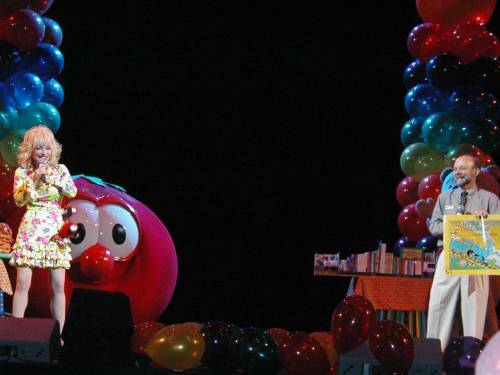 Dolly leads the crowd in singing "Happy Birthday To You" to Garfield. Bob The Tomato and Winnie The Poo can be seen in back. See additional pictures here! DOLLYWOOD -- Children of all ages and many adults who are kids at heart came to enjoy a day of fun on Friday to kick-off Dollywood's KidsFest. The crowds which turned out to see Dolly, Garfield, the VeggieTales, Purina Dog Chow Incredible Dog Team and ASA Events' extreme sport riders appeared to be as large if not larger than they were for this season's opening weekend. 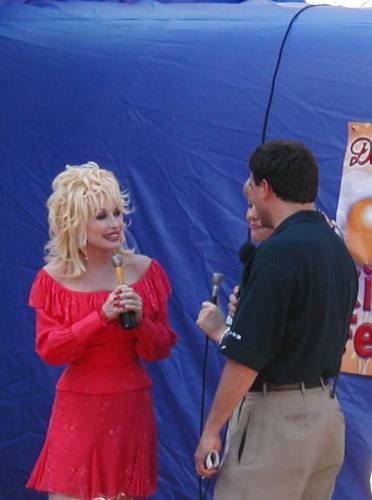 The day started at 10 a.m. with a welcome from Dolly herself in the Celebrity Theatre. She arrived to thunderous applause from the audience. "Well, hello there," she said. "Well, welcome to the first annual KidsFest! We're glad to have you here. Do you see all this stuff up here on stage? Now, don't you wish that somebody would make this big a to-do over your birthday! Yeah, so do I! And I'm hoping that when I turn 25 they'll make that big to-do over. Of course, they've got a little ways to go yet." After the laughter from her joke died down, the 57-year-old star continued. "Anyway, I want to welcome all of you. We're so happy to have you here today, and we're so excited 'cause you know this is a big, fun day. And I guess you all know why we're here. We're here to celebrate somebody's birthday. You know who? That's right! Garfield! He's 25 years old. 'Course, it doesn't seem like it, does it? He's been on television for that long, I think. And of course, John, Garfield's owner in the comic strip and Odie, his dog in the comic strip, well, they asked Garfield what he most wanted for his birthday, and he said he wanted to go to Dollywood! And I said, 'Yes!' But you know what, I think that Garfield heard about all the great food we have here at Dollywood and I really think he just wanted to eat his way through the Smokies. Now, I've done that, and I know that that is a great way to spend a birthday!" Introducing representatives from the shows at the park for KidsFest, Dolly told the crowd: "Anyway, everybody knows that if you're having a party, you've got to have guests. So we've decided to invite the best of the best to help us celebrate, not only Garfield's birthday, but also our first Dollywood's KidsFest. So we thought we'd just make it a big to-do. 'Course the new festival shares the goal with my Imagination Library which is to inspire as well as to entertain the kids. So over the next few years we're hoping to bring some of the biggest names in children's entertainment to Dollywood. And this year, some of the stars include some handsome high-flying athletes, some vegetables that any farmer would be proud to have, and some acrobatic dogs that's gonna win your heart. And, of course, the world's most famous cat. So if you're having a cat and a party like Garfield, 'course you're gonna want to have a dog or two to chase him around, right? So how 'bout you welcome the folks from the Purina incredible dog show! Hey! How cute is that! They're so cute!" She then brought on some trick riders from the extreme sports show, saying, "Of course, if you've got a dog chasing a cat, you've got to have somebody fast to catch the dog." Watching them perform, she joked, "I bet I can do all that. If it wasn't for these shoes, they won't let me try." Just then, they handed her some special shoes of her own. "Five-inch heels with wheels!" she exclaimed. "My dream come true!" 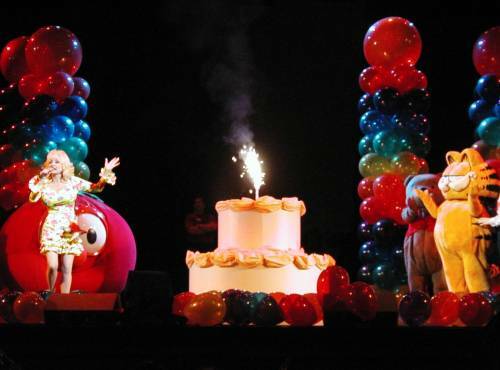 Dolly then said all of this excitement was bound to make everyone hungry, and she introduced the VeggieTales characters Larry the Cucumber and Bob the Tomato as "the most edible show around." When they arrived on stage, she confided to them: "'Course now, I just want you guys to know I was just joking about that edible part. We're not gonna do that. I was just joking." The vegetables brought with them a huge tray of lasagna for Garfield, as it is his favorite dish. They then asked Dolly what she got him for his birthday. "To be honest with you, I have to admit that the present I got for Garfield, I was in such a hurry to get up here with all the stuff that I ran off and left his present in Nashville," she explained. "But I did ask a friend of mine if he could swing by Nashville and hopefully get by here in time for the party , and I sure hope he did. So, a friend of mine, ah, lookie-here. Look who's behind the big tomato: Winnie The Poo!" Poo brought out Garfield's gift, a cart carrying the full Imagination Library collection that the Dollywood Foundation sends to children across the country. The program provides one free book per month from birth to age 5 for any child in a participating community whose parents sign up. Dolly and Poo with the books. Addressing the children in the crowd, Dolly said: "Now, how many of you folks have been to a party lately, you kids, and you get a present, too? I mean, that's just the way people do things now. 'Course, back in my day, which was, you know, about 25 years ago, as I mentioned, we were lucky to get a present of our own. And now every little kid gets a present. And I think that's great to make everybody feel special. So I figured that you'd come up here today and since it's Garfield's birthday we thought it would only be right for you to have a gift, too. So I got every one of you a little gift that they're gonna give to you later." Then Dollywood Foundation Executive Director David Dotson came on stage with an oversized copy of The Little Engine That Could, which is the first book in the Imagination Library series. Each child in the crowd was given a certificate to pick up a free (but normal-sized) copy of the book courtesy of Penguin Books and Coca Cola. "They call be the book lady, and I'm proud of it!" Dolly said. "'Course I hated school worse than any kid in the whole wide world, isn't it ironic that I'd be up here trying to help you learn to love it! It's important. Now I love doin' this. I'm doing more homework now than I did the whole 12 years I was in school." Fielding questions from the press, she was asked what was her motivation behind KidsFest. Dolly replied: "We just love working with the little kids, and there's nothing in this world that makes me more excited than making children feel good, making them proud of themselves and making them have a good time. So we just thought this is a great place for kids to come. They love to come to Dollywood anyway, 'cause we have so many great rides and a lot of areas for the kids. And we just thought if we could bring some live people and live entertainment, and some people that they know, so we just thought it would be something great to help entertain them and to draw a little more attention to our Imagination Library. So we thought it just all fit together, especially for our first year to kick-off KidsFest. " Asked about if the Imagination Library could reach some impoverished areas of the state, she reminded everyone that Governor Phil Bredesen had promised during his election campaign to take the program statewide in Tennessee. "Of course, he made the big excuse that we're behind schedule on our budget, and he does have a lot of other things to do," she said. "But he promised that last year because it helped get him elected, so I'm stickin' it to him. I wanna say, 'Now, you'd better put your money where your big mouth is and help us get this going!' So we're most definitely going to come to your area whether he helps us or not, 'cause I'm hoping to embarrass him on television to get him on it." When asked which VeggieTale she would be, she had a difficult time making up her mind, saying: "I would be all of 'em 'cause I like, I like all vegetables. Well, actually I'm almost old enough now to be a real vegetable! But I don't know what I'd like to be, I just like them all, so that's an unfair question, but thanks for asking it anyway. I think I'm a tomato, though. Don't you think? But a rotten one!" Then a child asked if Garfield would be attending his party. 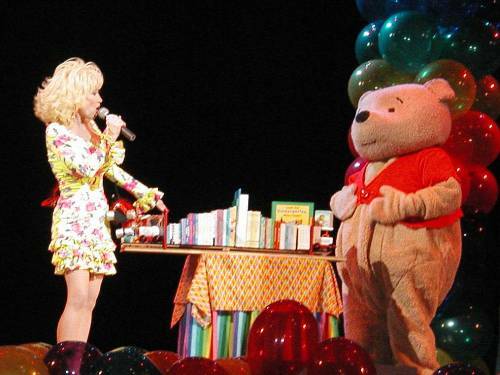 Dolly thanked the child for reminding her to bring him on stage and invited everyone to sing to him as she led the crowd in a rendition of "Happy Birthday To You" and "For He's A Jolly Good Fellow" as Garfield and a giant birthday cake with a sparkler in the middle came on stage. She said she guessed she needed to get a birthday kiss from Garfield and went over and planted a big smooch on his face. "Oooh! Good sugar!" she cried. She then instructed the staff to cut the two large birthday cakes at the foot of the stage so everyone could enjoy a piece as she left the theater. 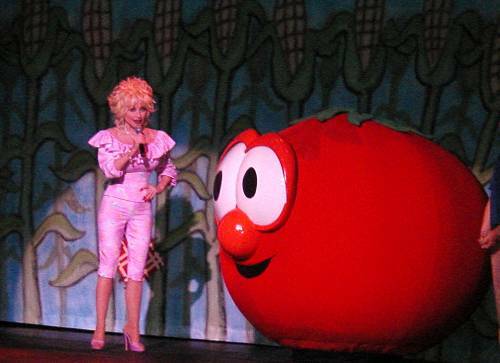 Toward the end of the 1 p.m. VeggieTales show, Dolly walked on stage to thank the singing vegetables for coming to Dollywood. Their show combines their tales Rack, Shack and Benny and The Pirates That Don't Do Anything into a live-action story that teaches children to stand up for their beliefs and to share. Dolly and Bob The Tomato. Immediately following that appearance, she took a carriage ride through the park grounds. 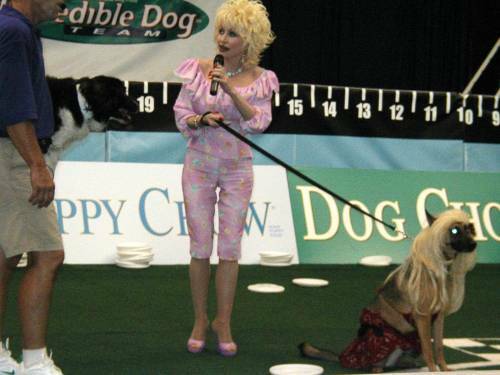 At the conclusion of the 2 p.m. Purina Dog show, the host was surprised when he was told to introduce Dolly to the crowd. She came out accompanied by a dog donning a blonde wig, dress and bra. Dolly said she found the canine at the park's dog kennel, Doggywood, which opened last year. Asked what the dog's name was, she said "Polly Darton." The show features several amazing dogs jumping, catching Frisbees and doing other stunts. Dolly Parton and "Polly Darton." She did a live remote for a local television station's Live At Five program in front of a large inflated sofa with the KidsFest logo, after which she made a final appearance at the extreme sports show for a quick photo op. The ASA show features 2003 Surf Expo third place Best Trick skateboard rider Richie Lopez, 1998 X Games bronze medallist and 2001 European X Games third place BMX rider Jason Davies, No. 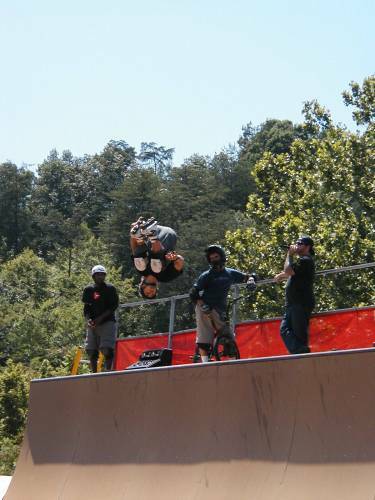 2 HSA-ranked BMX rider Jimmy Walker (who placed fifth in the 2002 X Games), 1998 Tour Champion inline skater Matt Lindenmuth, and second place 2002 World Championship inline skater Shane Yost. They perform on a full-stadium-sized half-pipe ramp built to world championship specifications. KidsFest, which is billed as the largest children's festival in the South this year and also includes a live-action Garfield birthday stage show featuring the cat himself, Odie and John, continues through Aug. 10. All shows are performed daily and included in park admission. Look for more photographs here.